The Drake LST 4-in-1 Wader Coat 2.0 is designed with the best waterfowling innovations that can't be found ain another brand's systems coat. The shell jacket has Spring-Open™ shell pockets, a Magnattach™ call pocket, zippered security chest pocket, Deep Water™ handwarmer pockets, four zippered storage pockets, and an over-sized rear pocket for storing extra gloves, dog lead, heat packs, and other bulky items you want to keep out of the way. The liner jacket even has its own set of features, including a Magnattach call pocket, zippered chest pocket, and lower zippered hand pockets. The liner jacket is reversible and has 200 grams of poly-fill insulation. For increased durability, Drake added reinforced material in high-wear areas such as the lower waist, lower back, underarms, and pocket openings. This coat wasn't designed in board meetings - it was designed in the timber holes, pits, and duck blinds. 4 Options in 1 Jacket: - Shell Jacket + Liner Jacket - Shell Jacket alone - Liner Jacket alone with camouflage exterior - Liner Jacket reversed to solid exterior Materials: 100% Waterproof/Windproof/Breathable Refuge HS™ shell fabric, Hypershield 2.0 Technology, adjustable neoprene cuffs, taped seams, reinforced wear areas with laminated 300-denier material. Reversible liner: Water-repellent Refuge fabric, 200 grams of poly insulation, zippered side pockets. Instinctive features: Magnetic chest call pouch on shell and liner, license/key pouch on shell and liner, call separator, deep water hand pockets, Spring Open Shell Pockets, storage pocket on back of shell with vertical zipper and zip off hood. The Drake 4 in 1 wader coat 2.0 is the best duck hunting systems coat I have ever worn. 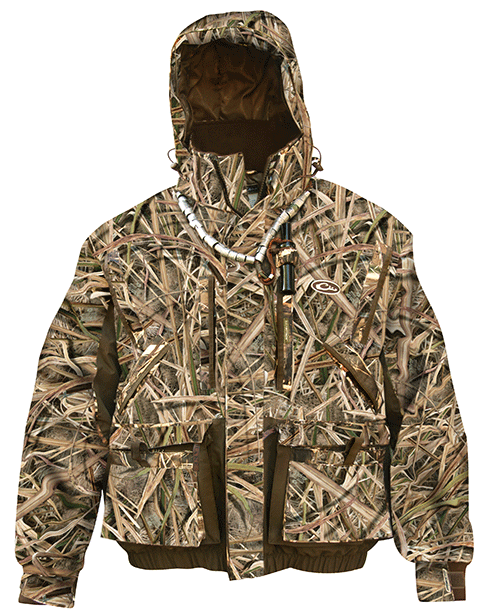 It has the most practical features for duck hunting and fits perfectly allowing for layering and movement.